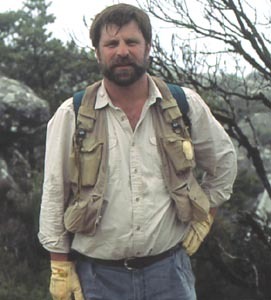 Art Evans stepped down as Director of the Insect Zoo at the Natural History Museum of Los Angeles County in early 2000 to do writing, consulting, and some teaching. He is now living in Virginia where he is also a Research Associate of the Smithsonian Institution.. Evans will be responsible for generating the key to the genera of New World Melolonthinae (approximately 89 genera) for the identification guide to New World pleurostict scarabs. To date, he is the only scarab systematist who has used modern phylogenetic methods to address the classification of a tribe of melolonthine scarabs. Evan's research interests in the Scarabaeidae focus on the higher classification of the Melolonthinae, systematics of the subsaharan melolonthines, biology of the scarab beetles of southwestern United States, and survey of the scarabs of Arizona and California. He is currently working an identification guide the scarab fauna of southern California. Evans, A.V. 1985. New host plant associations for adult scarabs (Coleoptera: Scarabaeidae: Melolonthinae) from Arizona and California. The Coleopterists Bulletin 39(1): 86-88. Evans, A.V. 1986. Notes on Valgus californicus Horn (Coleoptera: Scarabaeidae). Pan-Pacific Entomologist 62(1): 83. Evans, A.V. and K.A. Smith 1986. Four new species of Coenonycha Horn from California and Nevada with an illustrated key to all the species in the genus (Coleoptera: Scarabaeidae). The Coleopterists Bulletin 40(1): 81-92. Evans, A. V. (1987a). A new genus of Melolonthinae from southern Africa (Coleoptera: Scarabaeidae). Journal of the Entomological Society of southern Africa 50(2), 363-370. Evans, A. V. (1987b). A new species of Eucyclophylla Waterhouse (Coleoptera: Scarabaeidae: Melolonthinae). Journal of the Entomological Society of southern Africa 50(2), 487-491. Evans, A. V. (1987c). A new species of the genus Brachagenius Kraatz (=Xiphoscelidus Peringuey syn. nov.) with notes on they synonymy of Elipidus hopei (Burmeister) (Coleoptera: Scarabaeidae: Trichiinae). Journal of the Entomological Society of southern Africa 50(2), 351-356. Evans, A. V. (1987d). Revision of the genus Aipeiopsis Peringuey (Coleoptera: Scarabaeidae: Melolonthinae). Journal of the Entomological Society of southern Africa 50(2), 481-486. Evans, A. V. (1987e). Revision of the genus Oedanomerus Waterhouse (Coleoptera: Scarabaeidae: Melolonthinae). Journal of the Entomological Society of southern Africa 50(2), 357-362. Scholtz, C.H. and A.V. Evans 1987. Revision of the African Ochodaeidae (Coleoptera). Journal of the Entomological Society of Southern Africa 50(2): 399-426. Evans, A.V. 1988. Systematics of the subsaharan Pachydemini (Coleoptera: Scarabaeidae: Melolonthinae). Unpublished dissertation, University of Pretoria, South Africa. 210 pp. Evans, A. V. (1988). Three new species of Glyptoglossa Brenske (Coleoptera: Scarabaeidae: Melolonthinae). Journal of the Entomological Society of southern Africa 51(1), 87-96. Evans, A.V. and D. d'Hotman 1988. Coenonycha Horn in Baja California, Mexico (Coleoptera: Melolonthidae). The Coleopterists Bulletin 42(3): 205-210. Scholtz, C.H., D. d'Hotman, A.V. Evans and A. Nel 1988. Phylogeny and systematics of the Ochodaeidae (Coleoptera). Journal of the Entomological Society of Southern Africa 50(2): 207-240. Evans, A. V. (1989). Revision of the genus Sparrmannia Laporte (Coleoptera: Melolonthidae: Melolonthinae). Journal of the Entomological Society of southern Africa 52(1), 11-44. Evans, A. V. & Nel, A. (1989). Notes on Macrocyphonistus kolbeanus Ohaus and Rhizoplatys auriculatus (Burmeister) with comments on their melittophilous habits (Coleoptera: Melolonthinae: Dynastinae: Phileurini). Journal of the Entomological Society of southern Africa 52(1), 45-50. Evans, A.V. and C. Bellamy. 1996. An Inordinate Fondness for Beetles. Henry Holt and Co., Inc., NY, NY. 208 pp. Evans, A.V. 2002. 34. Scarabaeidae: Melolonthinae Macleay, 1819. May beetles, June beetles, and chafers. pp. 51-60. In Volume 2. American beetles. Polyphaga: Scarabaeoidea through Curculionidae. Arnett, Jr., R.H., M.C. Thomas, P.E. Skelley, J. H. Frank. CRC Press, Boca Raton, FL. 861 pp. Evans, A.V. 2003. A checklist of the New World chafers (Coleoptera: Scarabaeidae: Melolonthinae). Zootaxa 211. 458 pp. Evans, A.V., R.W. Garrision, and N. Schlager, editors. 2003. Grzimeks Animal Life Encyclopedia, second edition. Volume 3. Insects. Gale Group, Chicago, IL. 472 pp. Evans, A.V. and J. N. Hogue, 2004. An Introduction to California Beetles. University of California Press, Berkeley, CA. 299 pp. Evans, A.V. 2009. Phyllophaga spreta (Horn), a rare species of June beetle new to the fauna of Virginia, North Carolina, and Pennsylvania (Coleoptera: Scarabaeidae). Banisteria 33: 37-42. Evans, A.V. 2009. Notes on Valgus seticollis (Palisot de Beauvois) (Coleoptera: Scarabaeidae) in Virginia. Banisteria 33: 46-49. Evans, A.V. 2009. Hybosorus illigeri Reiche confirmed as part of the Virginia beetle fauna, with notes on Germarostes (Coleoptera: Hybosoridae). Banisteria 33: 58-61.